Following several weeks of scratches, goalie John Muse has been sent to the Charlotte Checkers for future considerations. Muse's time with Texas was shortened by the emergence of Maxime Lagace, who sprang onto the scene and claimed the starter job. Muse spent several seasons with the Charlotte Checkers before coming to Texas. The Stars play Charlotte twice more this season, April 1 and 2 in North Carolina. 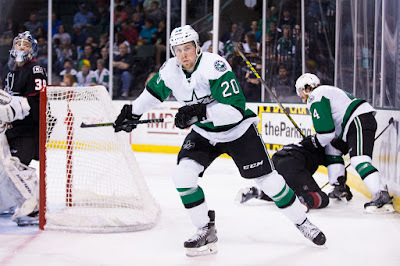 The Texas Stars, American Hockey League affiliate of the NHL’s Dallas Stars, announced Monday they have traded goaltender John Muse to the Charlotte Checkers in exchange for future considerations. Muse, 27, appeared in 19 games in his first season for Texas with a 9-3-3 record, a 3.02 goals against average and a .904 save percentage. The veteran goaltender has appeared in 127 AHL games in his career. Prior to signing with the Stars over the summer, the East Falmouth, Mass. Native played four years for the Checkers. 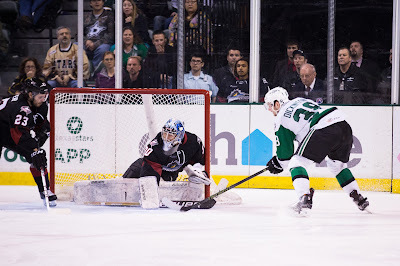 The Stars continue their homestand Wednesday against the Iowa Wild at 7:30 p.m. CST. "Our power play just has to be better," said Jason Dickinson. "Two 5-on-3s that don't connect change the game. It could be numerous reasons. We're not crisp enough moving the puck. I have to make better plays, we've all got to be better." Coach Laxdal continued, "We got the looks we wanted, but we just missed the net on wide open opportunities. We missed the net on the power play and on point shots. It's something we'll address." 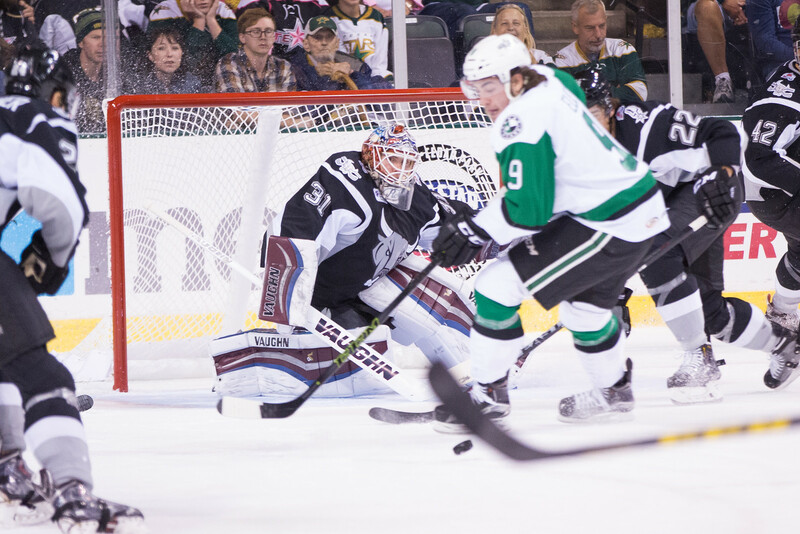 Maxime Lagace wasn't nearly as tested tonight with only 27 shots vaulted on the Texas net. His counterpart, Peter Budaj, earned his 30th win of the season with a 24 save effort. The Stars may be close to regaining some of their key players next week. Until then, bottom six players have been asked to step into big roles, according to Coach Laxdal. "You're not going to get [goals from them] every night." The best chances Texas had were off the rush as Texas tried to simplify its offense against Ontario. Texas killed an early 5-on-3 in the first six minutes of the game. Despite that effort, the Reign opened the scoring with a pair of goals. Rumbling down the left wing, Jonny Brodzinski picked the far corner on Maxime Lagace for the first tally at 8:27. Sean Backman notched his 15th of the year close in on the power play to set things at 2-0 two minutes later. Texas clawed back with a patient play by Curtis McKenzie at the net. He collected the puck from Brett Ritchie and maneuvered around Peter Budaj on the right wing side to deposit the pill. The clubs traded goals in the second. Sean Backman picked up his second of the night and fourth of the season against Texas. The power play goal came on a dangerous 4-on-3 advantage. 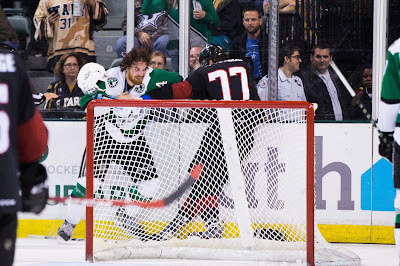 The Stars were in line for a power play of their own for a trip 200 feet from their net. Brendan Ranford, who earned the call, took an undisciplined roughing penalty to negate the advantage. Late in the frame, Texas gained some momentum heading into the intermission. The Stars used their team speed to hustle down the ice with Ritchie finding Dickinson crashing the net for the 3-2 score. "It was a huge swing for us, boosted morale," said Dickinson. "It just started from a funneled puck from Ritchie. It was fortunate it squeaked through." Texas came up empty on an early power play and another half-length 5-on-3 in the third. Ontario added another goal on a mistake on the forecheck by Texas and then an empty netter. The Stars play Iowa on Wednesday. Just a few notes with the same teams facing off for a second night. Last chance for Texas to earn a W against Ontario this season. This game ends the season series. 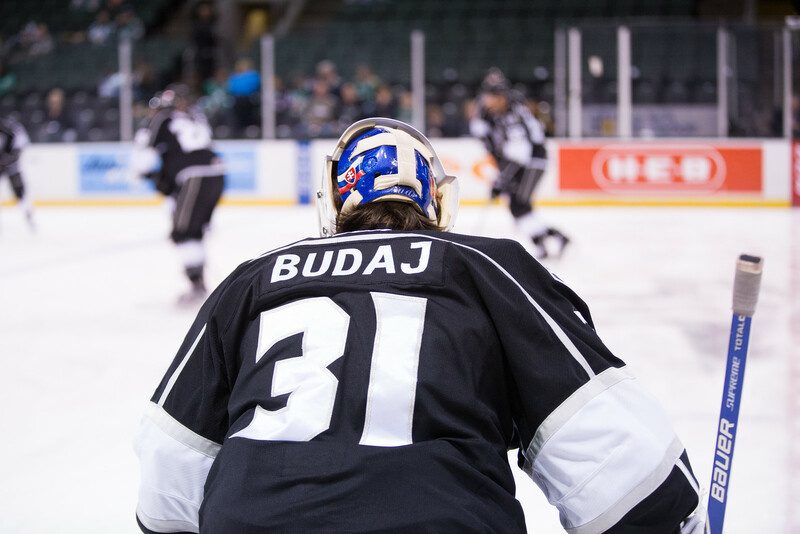 Peter Budaj is expected again in net for the Reign. Texas Stars coach Laxdal indicated with a wink and a nod last night that Maxime Lagace has 'young legs' and they'd see where he is in the morning. Odds are he'll be in for Texas as well, despite facing 51 shots last night. Coach Laxdal noted that Ontario and San Diego are similar in their heaviness, but I asked what made them different, specifically pointing to their records against the Stars (5-0 for Ontario, 1-5 for San Diego). Laxdal said: "Ontario is a much more defensive than San Diego. They play tighter and structure, that LA style. They're tough to play. Trying to get a grade A scoring chance, you have to create by movement." Another battle with Ontario led to another one-goal loss, this time in quite dramatic fashion. 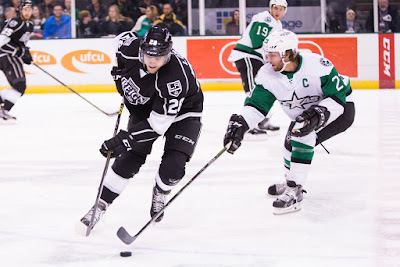 The Reign brought their playoff style brand of hockey to the Cedar Park Center and bombed 51 shots on Maxime Lagace in a 3-2 overtime victory. "One goal games can go either way," noted Derek Hulak, who scored tonight. "We're right there [with them]. We have to find a way to crack the curse." "Our coaching staff has done a good job putting focus on our defensive play. It's been growing and getting better, and I think you see it in our last stretch of games here. The guys have been coming together, buying into the systems." "The guys were doing a great job on the PK," said Lagace. "I could see every shot. All I had to do was make the save." When the game began, it looked like it could be another one of those 7-6 contests. Each team scored on its first shot. Derek Hulak opened things for Texas, pointing skyward in his Pink in the Rink jersey on his celebration as a nod to his mother and his friend, Cody Smuk, both of whom died of cancer. Hulak noted, "Pink in the Rink is near and dear to my heart. [Cancer is] something that has affected every one in one way or another. It's just another game when you get out there. You try not to think about it, but it was pretty special." Ontario scored three minutes later on their first shot. "It's going to happen in the season, a lucky bounce for them," said Lagace. "I had to bounce back, make the next save. That's all I was thinking about." Despite a 2-to-1 shots deficit throughout the game, the Stars appeared poised for overtime late in the third. Stephen Johns looked to skate the puck up and lost it to a forechecking Reign forward. Sean Backman buried it on the ensuing scramble for the 2-1 lead with 32.4 seconds left. Texas would head to the Ontario zone and earn a power play for the 6-on-4 advantage with 16 seconds left. Jason Dickinson continued his hot play with the tying tally from the slot with just 5 seconds remaining. Coach Laxdal philosophized that "overtime is overtime," alluding to the often coin-flip nature of the extra period. Texas got burned on a missed call that put the Stars down 3-on-2 heading back into their zone. Vincent LoVerde picked a corner for the 3-2 victory. These two teams battle again tomorrow. Texas fans have only seen the Reign once so far this season. The double-dose they will get this weekend pits the top two teams in the division against each other in a battle for .. well, not actually for the division. 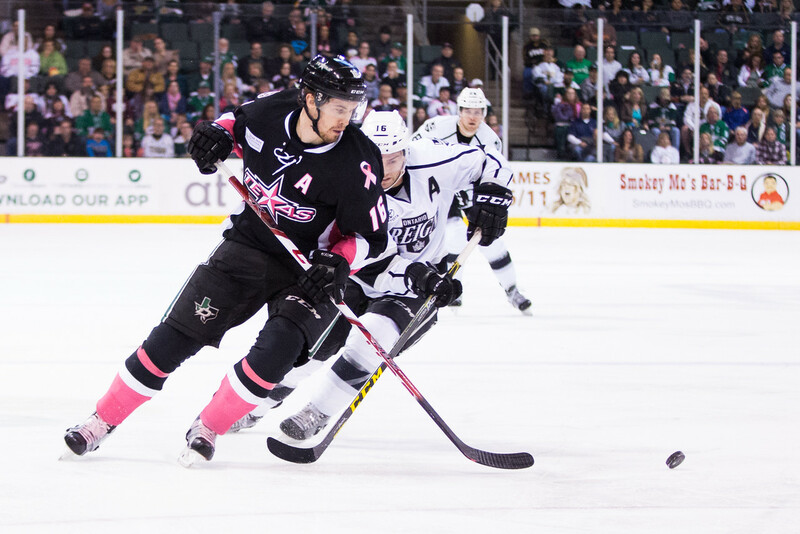 At this point, the Stars and Reign are pretty locked in as playoff contenders in the Pacific. Each holds a record better than .600. The real battle is for confidence. On the season, Texas has yet to win a single game against the Reign. If the playoffs started today, it'd be a good bet for these two clubs to meet in the second round. Ontario hold a 7-2 advatange in the season series with #4 San Jose while Texas has a 5-1 mark against #3 San Diego. Of course, if you're going to go by season series record, that puts a pretty bad stink on the second round matchup: 0-4 for Texas. And so this weekend is for confidence building. If Texas can win these games, it will not only be a victory worth two points in the standings. It could also be a victory worth a berth into the Western Conference Finals in May. Thanks to injuries and callups, the Reign will be without some notables. Adrian Kempe did not travel with the team and Sean Backman is questionable after leaving their last game last weekend. Paul Bissonnette is injured and will also not travel with the team. Former Rookie of the Year Michael Mersch is eating popcorn in the Kings press box. All of this is as reported by Lindsay Czarnecki, who you should really be following on Twitter @ReignInsider. Texas is unlikely to see any change to its injured ranks. As expected, the Texas Stars have assigned Philippe Desrosiers to the ECHL's Idaho Steelheads this morning. Desrosiers is still a young goalie and needs playing time to continue improving. With the emergence of Maxime Lagace as a true #1 goalie for Texas, Desrosiers' ice time has been limited. In Idaho, he will be the #1 and get all the ice he can handle. 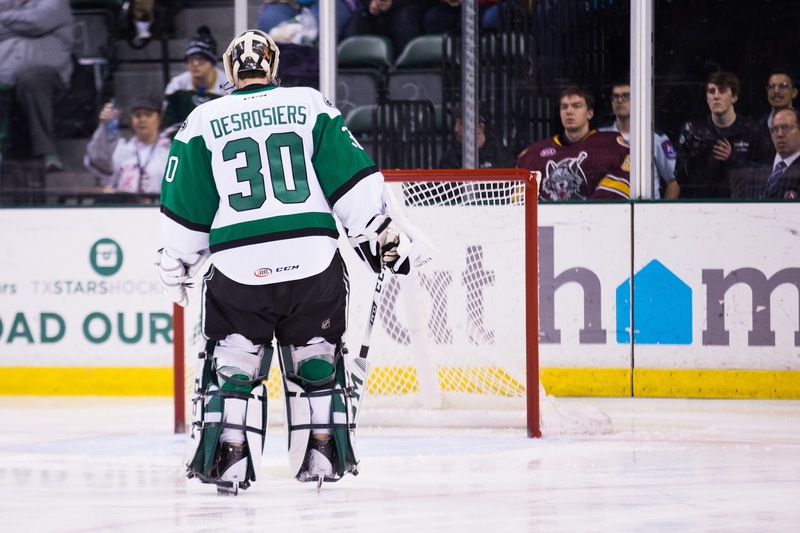 The Texas Stars, American Hockey League affiliate of the NHL's Dallas Stars, announced Thursday rookie goaltender Philippe Desrosiers has been reassigned to the team's ECHL affiliate, the Idaho Steelheads. 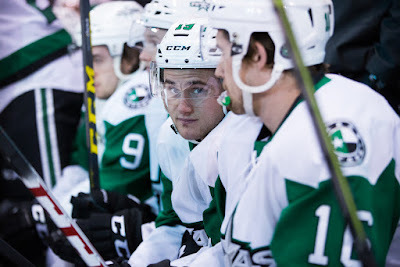 Desrosiers (deh-ROH-see-ay, fih-LEEP), 20, made his AHL debut on Jan. 3 and has appeared in 10 total games this season for the Stars. The 6-foot-1, 190-pound native of Saint-Hyacinthe, Quebec has tallied a 2.82 goals against average, a .903 save percentage and a 5-5-0 record with Texas. In the ECHL this season, Desrosiers has recorded an 8-6-2 record with a 2.46 goals against average and a .907 save percentage. Desrosiers was a second-round pick of Dallas (54th overall) in the 2013 NHL Entry Draft. Coming off a short week, it's Brett Ritchie earning his first player of the week honors here on the site. Over the course of the week, Ritchie was even in two games with a three assists. I mention the even rating as he was even in both games, including a 4-1 loss the Stars suffered in Ontario on Friday. We'll even give Ritchie partial credit for the four point effort he had against San Diego 8 days ago. With a goal and six assists in the last three games, Ritchie is averaging better than a point per game in the month of February. That's the type of tear he needs to be on in order to get himself back to Dallas, where many assumed he would start the season. A preseason injury halted those plans. Now he is clawing his way back to try and make it into the NHL again. For a scorer like Ritchie, a wrist injury is a tough one to recover from. With Jason Dickinson, Brendan Ranford and Curtis McKenzie all also making legitimate cases for the next callup, Ritchie's path is going to be very much based on what he's done lately. "It's a good problem to have," Stars general manager Jim Nill told the Dallas Morning News when Ritchie came off IR in December. "You always want that competition to move up. I think that makes everyone work harder. And then you want a strong affiliate where these players can make each other better on the ice." 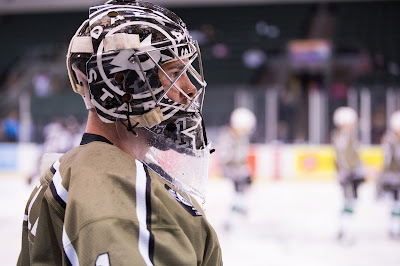 It's time to see if 20 games in the ECHL did any good for Jack Campbell's AHL confidence. The former first round goalie was recalled the afternoon to the Texas Stars. 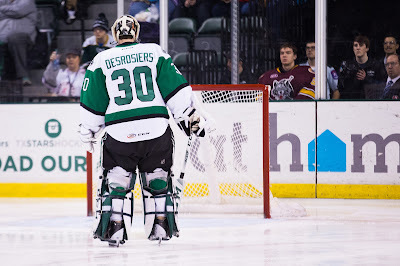 It is expected that Philippe Desrosiers, who is 5-5 with the Stars this year, will be assigned to Idaho before the weekend. One cynical but perhaps realistic way to view this recall is to raise Campbell potential value as a trade asset. It's a tricky argument though as he has been performing well for weeks in the ECHL and there are only two games left for him to prove himself in the AHL before the deadline. If this were the case, you would have called him up weeks ago. Therefore, I don't think that's the reason. The Texas Stars, American Hockey League affiliate of the NHL’s Dallas Stars, announced Wednesday they have recalled goaltender Jack Campbell from their ECHL affiliate, the Idaho Steelheads. Campbell, 23, went 14-5-0 in 20 games with the Steelheads during his assignment. 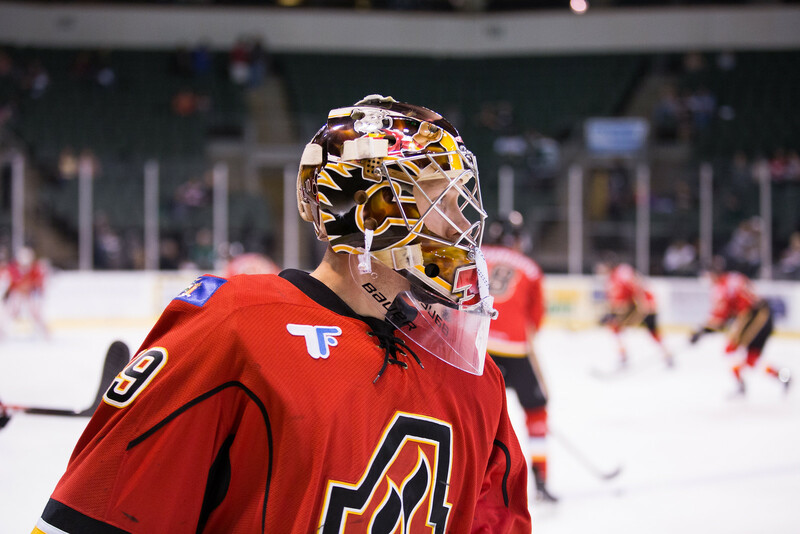 He was twice named the ECHL’s Goaltender of the Week and named the league’s Goaltender of the Month for January. Campbell recorded a 1.68 goals against average and a .944 save percentage in Idaho. This season with the Stars, Campbell carries a 3-6-3 record, a 4.27 goals against average and a .868 save percentage. The 6-foot-3, 195-pound goaltender was selected in the first round (11th overall) by Dallas in the 2010 NHL Entry Draft. 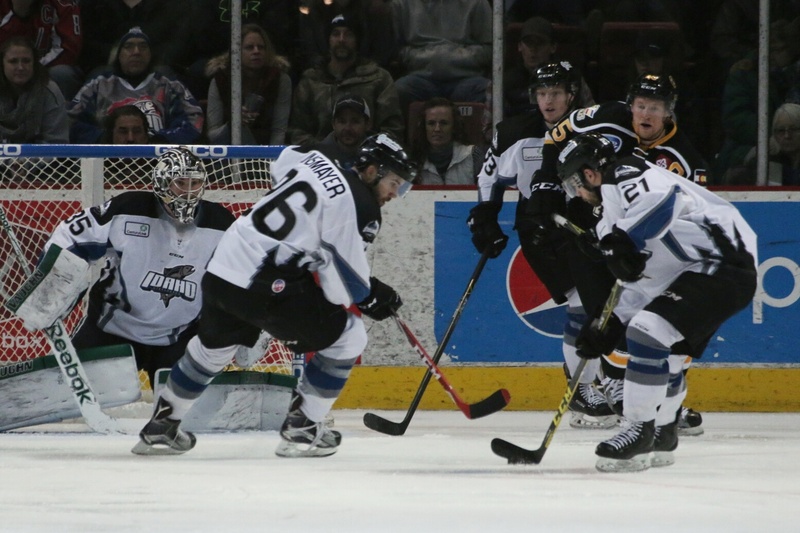 As rare as a leap year, it’s another Idaho Steelheads report. 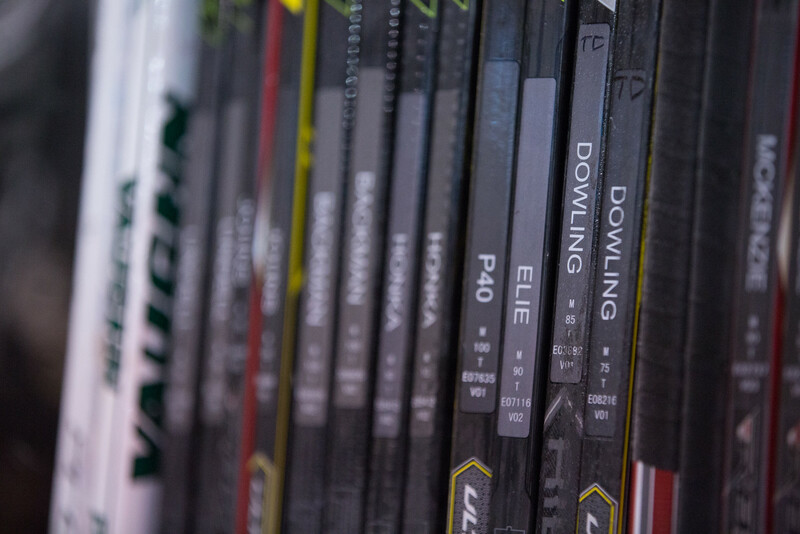 The last report had the Steelheads earning points in 10 of 12 games, pulling themselves out of the bottom of the Western Division and into a playoff position. One thing that was hanging over Idaho’s head was the fact that they had played the most games of any team in the ECHL through that point in the season, so the challenge going through the rest of January and February, was play well enough to hold their position in the standings and hope for some help during that time with teams losing some of their games in hand. The scenario would have been great. What happened was even better. Since the last Steelheads report, the Steelheads have gone on to win 12 of 17 games, putting themselves into first place in the Western Division at various times during the past two weeks. During this push, the Steelheads have twice had four-game winning streaks and at one point won eight out of nine games. This is a team that, since December 10th, has been the best team in the ECHL, and the record has shown that. They went from a team with a 7-14-4-0 record up to that point to turn things around to a 21-6-1-1 record since. Also during this stretch of games Jack Campbell won the CCM ECHL Goaltender of the Week award twice in January, as well as January’s Warrior Hockey Goaltender of the Month award. Campbell will be the first to tell you that he doesn’t get those awards without great team play in front of him. I wholeheartedly agree in that assessment. Right back on the horse for Texas. The best way to overcome a loss is to play again quickly, a chance for 'quick redemption' as the coaching staff would say. Texas faces off against another divisional foe this evening, this time one they have had more success against on the season. 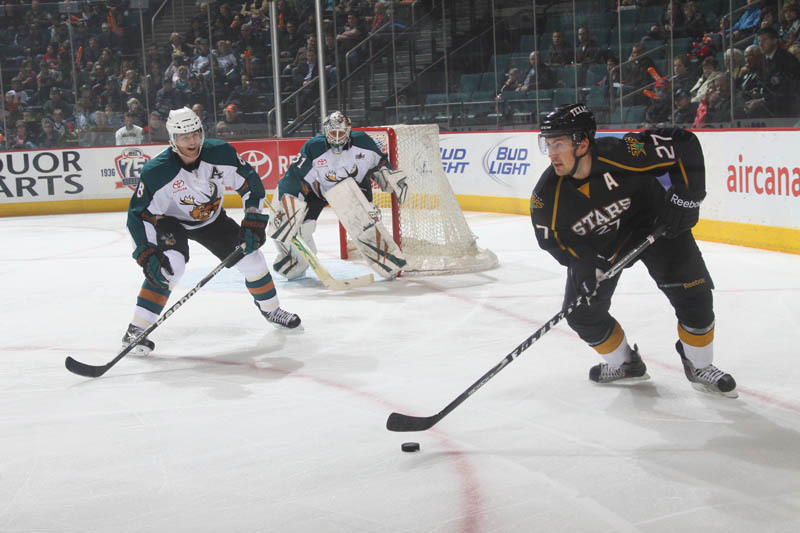 The Stars have yet to lose to the Condors this year at home or away, claiming a perfect 4-0 record so far. Bakersfield is on the upswing. They just had a five-game win streak snapped last night, similar to Texas, by divisional rival San Diego. Their recent winning ways have vaulted them into third place in the Pacific. However, their lead is quite tenuous. Two other teams, San Diego and San Jose, also possess 0.543 win percentages and all three play again tonight. One notable factor in tonight's game is the presence of a former Texas Star on the other side of the ice. Luke Gazdic is lacing them up in Bakersfield at the moment, currently seven games into his assignment there. In those games, he has a goal and three assists. 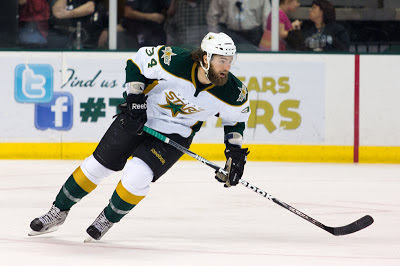 Given the injury situation though, if Justin Dowling, Travis Morin and Greg Rallo do not play, Curtis McKenzie will be the only Texas Stars who played with Gazdic in Texas to lace up for the Stars tonight. Even at that, McKenzie only played five games at the end of the 2013 season and two playoff games. Amazing how fast things change. One way or the other, something had to give. Texas had won six straight games coming into tonight's contest and Ontario had yet to lose to the Stars all year. The Reign came out victors, ending the Stars' win streak at six and goalie Maxime Lagace's at 11. Through two periods, Texas held tough despite a massive shot differential of 24-11. After forty, the clubs were tied at one with Jason Dickinson's power play tally standing as the lone Texas marker. Ontario came alive in the third period. Vincent LoVerde scored the eventual game winner just 3:46 into the frame and the Reign would add two more for the final score of 4-1. Lagace's 31 save performance was bested by Peter Budaj's 21 save effort on 22 shots. The Stars continued to suffer from injruies to their top forwards. Travis Morin missed his second straight game, putting Derek Hulak with the captain's C for the first time in his career. Texas faces Bakersfield tomorrow night. Derek Hulak wore the captain's C in Morin's absence. Yes, a six game win streak is awesome, but tonight's game is where the rubber meets the road. The Ontario Reign are the top team in the division and have been all year. Their seemingly insurmountable lead has been chipped away at thanks to the callup of Peter Budaj, showing that the team is very much a product of their MVP calibre goaltending. Budaj is back from Los Angeles, and the Reign have already won a game with him back in net. However, this contest is a 1 v 2 matchup and starts the second half of the season series between these two teams. Head to head matches are the best way to earn points against a club you're trailing, obviously, so the importance of tonight's game is high. Texas hasn't had good luck so far this season against Ontario. Even with Budaj out of the net in two of the three games so far between the teams, each has been a one-goal loss for the Stars. To continue the trend, the Reign will make a trip to Texas and San Antonio over the next two weeks and then spend the rest of the season in California. Sometimes, being the player of the week isn't about mindblowing stats or highlight reel performances. Sometimes, it's just about performing on a consistent level and having success. 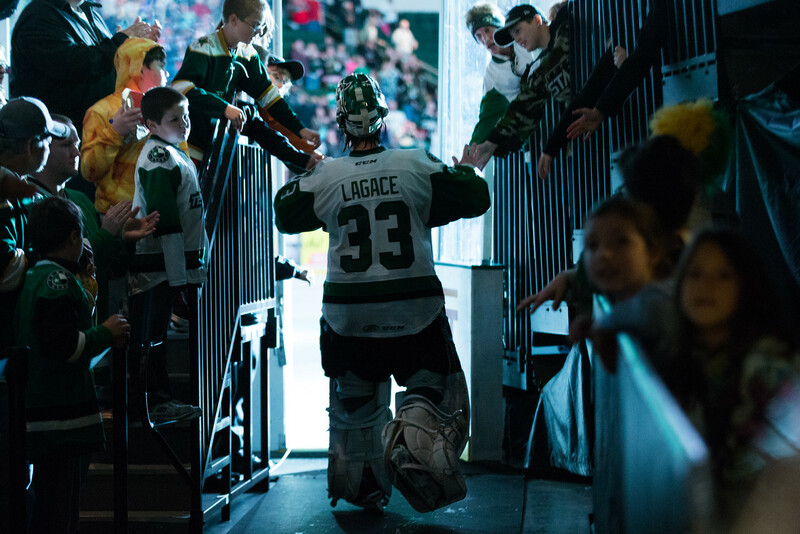 This week, it's time to honor Maxime Lagace, the engine behind the Stars' current six game winning streak and a large part of their success over the last three months. "Laggy" has a personal eleven game win streak going at the moment, which stretches back to November 28th, 2015. In the past week, he was dominant when he needed to be, keeping Texas in a very rough first period on Sautrday against Lake Erie. Players and coaches alike admitted postgame that the score could have been 5 or 6 to nothing. With Lagace's performance, Texas held it to 2-0 after two and later climbed back in to win in overtime. On the week, Lagace is 3-0 with a 2.29 GAA and .939 SV%. This is the type of effort that the Stars expected from others in the system this season. However, the good news is that the world of hockey is based on merit. If you're playing well, you can move up and get a chance at the next level. Lagace got that chance and grabbed hold with both hands. In late game action, the Texas Stars extended their winning streak to six with a 6-3 effort over the San Diego Gulls in California. The win ends the season series with the Gulls at 5-1-0-0 for the Stars. 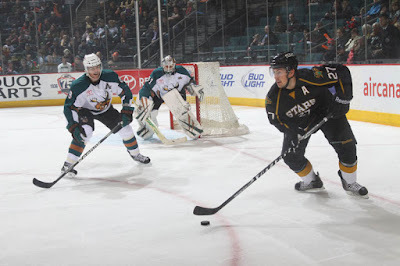 Brett Ritchie was the standout performer, notching a goal and three assists for a four-point night. Maxime Lagace won his 11th straight decision, a streak stretching back to November, with 42 saves on 45 shots. 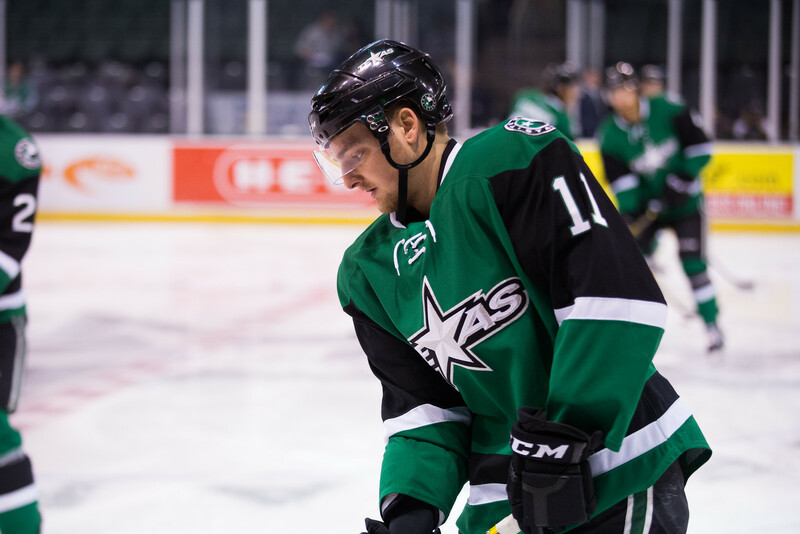 The Stars were without the services of Travis Morin this evening. The captain was injured late in the Stars' game against Lake Erie on Sunday. Stephen Johns wore the captain's C in his absence. Texas burst out to a two goal lead in the first on goals by Remi Elie and Matej Stransky and never trailed in the game. San Diego would pull within one several times, but the Stars always had the answer. The penalty kill was a perfect 5-for-5 on the night and the power play scored once on three opportunities. Curtis McKenzie and Jason Dickinson continued their recent hot streaks with a goal each and two assist for McKenzie. Cole Ully scored the ultimate game winner, his second tally in the last week. He and several others are being called upon as Texas becomes thinner in scoring due to injuries and callups. The Stars stay in California to play Ontario on Friday. 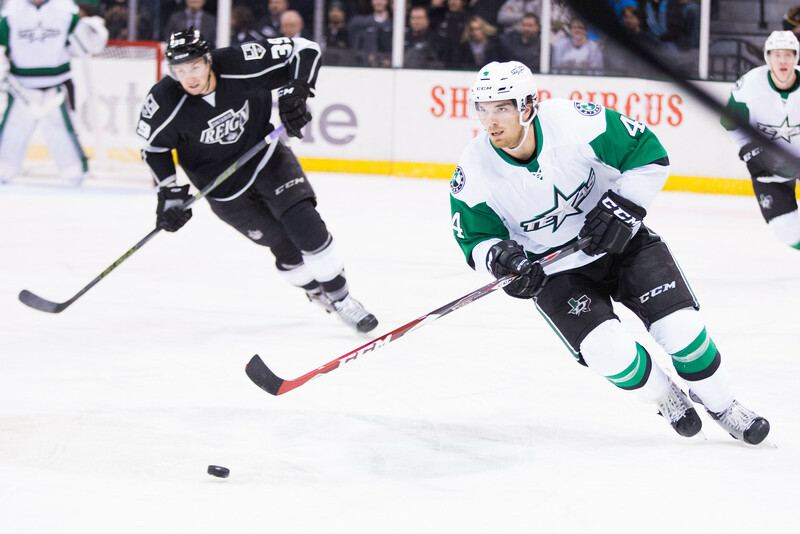 UPDATE: Curtis McKenzie has been reassigned. The San Diego Gulls are returning to their home arena after their longest road trip of the year, not in time but in distance. Two games against the Charlotte Checkers took the Gulls three time zones away from their nest in southern California. They took both by one goal each, handing Charlotte a loser point in OT on Friday. For San Diego, even though it was non-divisional game, it was a bad point to give up. Charlotte is currently in position to claim the Gulls' spot in the Pacific division playoff race if the postseason began today. 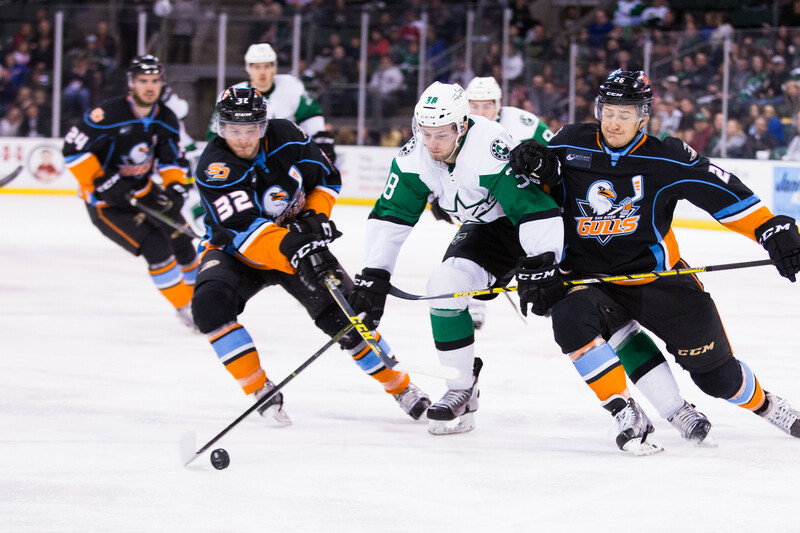 The Gulls really front loaded their travel and have already played every game against the Stars in Cedar Park for the season. Further, they will not leave the state of California for the rest of the season with San Antonio being the only team to visit them from out of state after tonight's match. Texas has had a lot of success against the Gulls this season. In compiling a 4-1 record, the Stars have outscored the Gulls 21-12. SD's lone win came in Cedar Park as they clogged the lanes and slowed down the speedy offensive attack of the Stars. Texas rebounded the following night in a 5-2 win. The Stars are really riding a streak right now. The team itself is on a five game streak and their starting goalie, Maxime Lagace, hasn't lost a game since November 28th. Derek Hulak and Travis Morin are both expected to be in despite late game injuries on Sunday. Can Anyone from the California Five Win An Individual Award? Among all the issues with the California Five, one that hasn't been touched on yet is the issue of individual awards. With five teams in the league playing eight fewer games than everyone else, that's eight fewer chances to collect goals, assists, shutouts, etc. So can anyone from the California Five win an individual award? The brutal truth about the AHL's award system is that it is incredibly biased toward statistics. Matt Murray, the winner of the Rookie of the Year and Bastien awards last year, never played a single game west of Hershey, PA. Sean Shapiro and I, the media voters for the Texas Stars ballot, still put him at the top of both of those award ballots. The numbers were eye-popping and the general chatter was positive. It is a tough thing to justify and we fight and grapple with it every year, comparing all the information we can find short of watching all the games again. It's the reason we tend to focus our votes on Western Conference players. It's not bias; it's just what we know. So that brings us to the point at hand. Let's take a theoretical race for the MVP, which has been awarded to the top scoring player in the league in 8 of the last 11 years. It's as good a proxy as we can get for the winner and it's probably a good way to predict for the award's top candidates anyways. I'll also add that usually the MVP award, like the Heisman, usually comes from a team that is at the top of the standings or certainly is making the playoffs. That's not as relevant right now since our top candidates are all on playoff-positioned teams. Alright, now who is the top candidate from a California team? Probably Derek Grant (23-15-38 in 30 GP) or Matthew Ford (20-18-38 in 41 GP). Grant is our most likely candidate from Stockton (ignoring the fact that Stockton is in sixth place in the division). The Heat have 26 games left in the season after this weekend, and Grant has amassed 38 points so far. Even if he scores at exactly the same blistering pace (1.27 points per game) the rest of the way, he will only make it to 70 points. There are at least four players from the rest of the league (all from playoff teams) that will easily beat that total in their 76-game schedule: Chris Bourque, Seth Griffith, T.J. Brennan and even Travis Morin. The only player that I could see making a run at any post-season award is Peter Budaj. He has played in all but seven of Ontario's games this season with a 1.58 GAA and 0.935 SV%. That's a pretty reasonable games played total for players in any division. For comparison, Matt Murray, last year's winner, played just 40 games in a 76 game schedule. The wrinkle here is that Budaj is now in Los Angeles after injury to Jonathan Quick. Word is that Quick is on the mend. Every game that Budaj does not play in Ontario is another mark against him in the 68 v. 76 debate. For the California teams, Budaj is their only hope for individual recognition. UPDATE: Curtis McKenzie gets the recall to Dallas. Same team again this afternoon but with a grudge for sure. Lake Erie was the better team for 45 minutes of last night's game and was audibly upset after the game and with good reason. Maxime Lagace took a puck off his blocker hand under the blocker in OT last night and could be out today. The team will make a determination in the morning. If not, he could go again. Tyler Seguin was cut last night in Dallas. With the NHL club having games on Monday and Tuesday, any recall would probably happen today before the game to ensure there isn't an overworked player getting the callup (four games in four days). Watch for that. Two periods into tonight's contest, things were not going well for the Texas Stars. The home side was down 2-0 and should have been down more if not for some stellar play from their goalie, Maxime Lagace. The third period was a complete turnaround that vaulted Texas to a 4-3 home win in overtime with the winning goal coming off the stick of Jason Dickinson for the third time this week. "Just don't quit," said Dickinson. "We knew we were doing the right things. We just stuck with the game plan and got those goals. It's a bunch of confident and positive guys. Nobody quits." Coach Laxdal called the game "a gutsy character builder" for his team and praised the effort of guys who are stepped up in the absence of recalled and injured forwards. Dickinson is chief among those right now. Dickinson has four goals and three assists this week alone. "He's been playing real well," continued Laxdal. "It's part of the development and process. Confidence is big for him. He's getting rewarded for hard work offensively. He's taking a step here with our group and it's good to see." Another player who has continued to step up is Maxime Lagace, who collected the overtime win with 33 saves. Jason Dickinson said the team knew they had to win the game for Lagace, especially after an athletic save he made with 14.8 seconds left to maintain the tie, "We're playing for this guy and he's playing for us. Lagace really kept us in there. It could have been a completely different game. " TJ Tynan found twine in the first with a power play goal and Jaime Sifers extended the lead with a point shot through traffic in the second. The Stars collected a power play goal of their own with Julius Honka hitting the net through traffic early in the third. Laxdal said the goal gave his club life, but then Lake Erie regained their two goal lead and took back that life. Stephen Johns stepped up on a net-front scrum and picked up a fighting major, which Laxdal says sparked the team for what would come. Just 39 seconds later, Brett Ritchie scored from in tight to make it 3-2 Lake Erie. A few minutes later, Esa Lindell would finish off a beauty pass from Curtis McKenzie on a shorthanded bid for the three all tie. 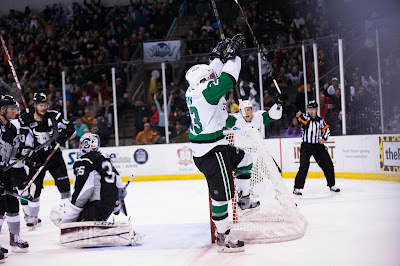 Maxime Lagace did his acrobatics to keep things knotted and Texas picked up a point after trailing by two after forty. After much time in their own zone to start OT, Texas' Jason Dickinson entered the fray in overtime with a wrap around goal that bounced off Troy Vogelhuber and in. These two clubs will play a Valentine's Day matchup tomorrow afternoon. Lake Erie ain't no joke. Since last playing with Texas, they've rattled off four straight victories allowing just three total goals. Those four games were all against divisional foes, which pushed the Monsters to third place in the Central Division. It seems like the Central has settled in a bit and the teams that will make the playoffs are mostly settled. Chicago, in sixth place, needs 8 wins ignoring all other factors to climb to fifth place and take the crossover spot to the Pacific (according to the playoff projections). That seems unlikely right now, putting Lake Erie into the playoffs for just the second time in their nine year history. Their only other visit was a first round exit in 2011. That club was led in net by Dallas' 2001 first round pick, Jason Bacashihua. A big part of the Monsters' recent success has been their man in net now, Brad Thiessen. Many fans will remember Thiessen from his four-year stint in Wilkes-Barre. It seems that wherever he goes, the team has success. Aside from last year's aberration backstopping the less-than-stellar Flames, Thiessen has never missed the playoffs. In 14 games this season spent in the AHL, Thiessen is 8-2 with a 1.58 GAA and .939 SV%. It's surprising that he spent so much of the year in the ECHL, but hindsight is always 20/20. With injuries in Columbus, Forsberg was recalled and Thiessen came up from Cincinnati. Now Lake Erie carries three goalies, similar to Texas. Also similar to Texas, it is because of the success of a player they expected to be in the ECHL all year. Interesting to watch who they play this weekend, down the stretch and in the playoffs. Jason Dickinson is stepping up big time. Since the departure of Greg Rallo, the rookie forward has been a force for the Stars. That's a really good thing because with Rallo's scoring suddenly off the scoresheet, someone had to step up. Dickinson is one of those lending a hand. This week, that help came in the form of a seven point week that included a game-winning goal and a shootout winner in the Stars' games in Manitoba. Despite his scoring, Dickinson ended up minus-1 on the week though, so there's always something to be improved on. He has said before that he wants to be known for his defense, so it is certainly a point he will look to improve upon. That being said, he was plus-2 in the game last night which features no special teams goals. Texas survived an extremely raucous back-and-forth affair in Manitoba this evening. They eventually came out on the right side of a 7-6 shootout final, but not before scoring five in a row only to give back three and end up tied after regulation. The Stars were up 2-1 after twenty with Derek Hulak netting the single Texas goal. The Moose added a third for good measure to open the second. Then Texas went on a tear. 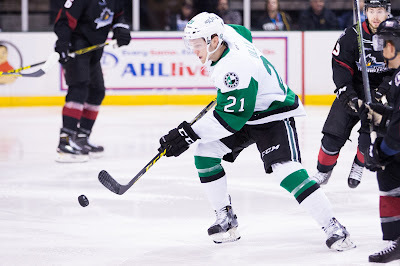 In order, the Stars got goals from Esa Lindell, Jason Dickinson, Ludwig Bystrom, Julius Honka and Curtis McKenzie. By the midpoint of the third, they led 6-3 and seemingly had the game locked down. Manitoba made Texas look like the team they were back in November though. The Moose climbed back into the game with three goals in the final 10:02 of regulation. Texas would play a scoreless overtime and head to the shootout. Brendan Ranford did not attempt his fake move and didn't score. Travis Morin and Jason Dickinson did. Jason Dickinson was the Stars' best player on the night with a goal, two assists and the shootout tally. With players like Greg Rallo and Justin Dowling out of the lineup, Dickinson has an opportunity to step into the scoring role that he is clearly taking advantage of. Texas returns home to play Lake Erie on Saturday. Texas is cruising. Down late last night, they overcame with some power play magic. Playing the second same team for the second night in a row, Texas seems to be having success with their lineup as it stands. The team is missing several of its top scorers (Faksa, Rallo, Dowling) but still winning. This is a good sign for the Stars overall as you look at the depth scoring. Guys like Jason Dickinson and others need to step up in the void. The way Manitoba has been rolling Eric Comrie, I would expect him again tonight. Maxime Lagace could go again tonight, but it certainly depends on how his injury felt after last night's game. Jason Dickinson had a pair of goals, including the late game winner, as Texas defeated the Moose this evening in Winnipeg in the first game of the season between the two. Maxime Lagace returned to the lineup after a lower body injury held him out for several games. He stopped 27 of 29. The Stars power play was a big catalyst on the night, going 3-for-7 and obviously scoring all of the night's goals. Texas cashed in 5-on-3 as well. Brendan Ranford had two assists to continue a point streak now at four games, and Brett Ritchie had the Stars' only other goal on the night. The game winning tally came with Patrice Cormier in the box for delay of game. Jason Dickinson beat Eric Comrie with just 47 seconds in the game, giving Manitoba no time to respond. Jason Dickinson finished with two power play goals and the Texas Stars scored twice in the final three minutes of regulation to take a 3-2 road win over the Manitoba Moose on Tuesday night in front of 5,406 in attendance at MTS Centre. Dickinson’s second power play goal held up as the game-winner after Brett Ritchie knotted the score at 2-2 less than two minutes earlier. Maxime Lagace won his sixth straight start with a 27-save performance in net, and Brendan Ranford extended his point streak to four games with an assist on Dickinson’s first goal. The Stars (27-18-3-3) and Moose (12-27-3-4) wrap up their two-game set on Saturday at 7 p.m. CST in Winnipeg. Back-to-back penalties late in the third handed Texas a 5-on-3 power play with 2:39 remaining, and the Stars didn’t waste their opportunity. Just seconds into the two-man advantage, Travis Morin set up Ritchie in the left circle to snap home his 12th goal of the season and knot the score. Then, with 46 seconds left to play, Jason Dickinson finished off an odd-man rush from the slot on a wrist shot that beat Manitoba’s Eric Comrie for his 12th of the year and second of the night. Lagace held off one last push from the Moose with the extra attacker on the ice to seal his 11th win of the season. After a scoreless first period, Manitoba opened up the scoring off a loose puck in the goal crease that was batted in by John Albert 27 seconds into period two. Texas knotted things up on the power play as Dickinson located a loose puck at the left side of the goal crease and stuffed it past Comrie, who ended up finishing with 30 saves on the night. Manitoba took a 2-1 lead 3:30 into the third when a centering pass deflected past Lagace off the leg of Darren Kramer for his third of the year prior to the Stars late offensive outburst. The Stars finished 3-for-7 on the power play while the Moose went 0-for-3. The return of the Manitoba Moose is not all they had dreamed of. Of course, there is AHL hockey being played at the MTS Centre once again, but the quality is severely lacking and the Moose find themselves with the worst record in the league. Greg Rallo handles the puck in the last game between these two teams on March 20, 2011. The team, whose prospects pool played Texas two years ago in the Calder Cup Finals, has compiled just 12 wins on the season. They are coming off a marquee win against league-leading Toronto but lost their previous four straight before that one. Texas comes to town in the middle of a six game homestand. These are two games that the Stars have to win. A lot of familiar names dot the roster of the Moose. One of the most notable for Texas fans will be Matt Fraser. The forward who played two seasons in Texas still owns the record for most goals in a season and came very close to winning the Marshall Award (most goals) in the forgettable 2011-12 season. He was packaged with Reilly Smith and others for Tyler Seguin in the summer of 2013. Since then, Fraser spent the entire 2014-15 season in the NHL, split between the Oilers and Bruins. He signed with the Jets in the summer of 2015 but has yet to play an NHL game for his hometown club. In fact, he has only four goals and seven assists on the season. Fraser's struggles really highlight how bad Manitoba is overall. The team does not generate a lot in terms of offense, spends much of their time in their own zone, and gives up goals accordingly. They rank last in the league in both goals for (2.07) and goals against (3.49). In net, the team has put itself on the back of Eric Comrie, who has started all but two of their games in November 22nd. The young tender, who was a black ace during the IceCaps Calder Cup run, is 10-18-5 with a 3.11 GAA and a .907 SV%. That save percentage also shows of something else about the Moose. They ranked last in shots for (26.49) and shots against (34.29). Comrie sees a lot of rubber. Rookie Chase De Leo is a center to watch (13-13=26). Brendan Kichton (4-19=23), also a player in the Calder Cup days, is the leading defenseman on the squad. Former Kamloops Blazer and Brendan Ranford teammate JC Lipon rounds out the top three in scoring (9-13=22). He had a five point night in the aforementioned win against Toronto. The Texas Stars have recalled Emil Molin from the Idaho Steelheads. This marks the second callup for the rookie forward. Molin has been burning up the ECHL (19-19=38 in 46 GP), and while his callup is a good reward for that, it certainly isn't a good sign for the health of some of Texas' banged up players. Justin Dowling has not played since a kneeing incident on January 15th and Greg Rallo is out after a slew foot last week in Cleveland. 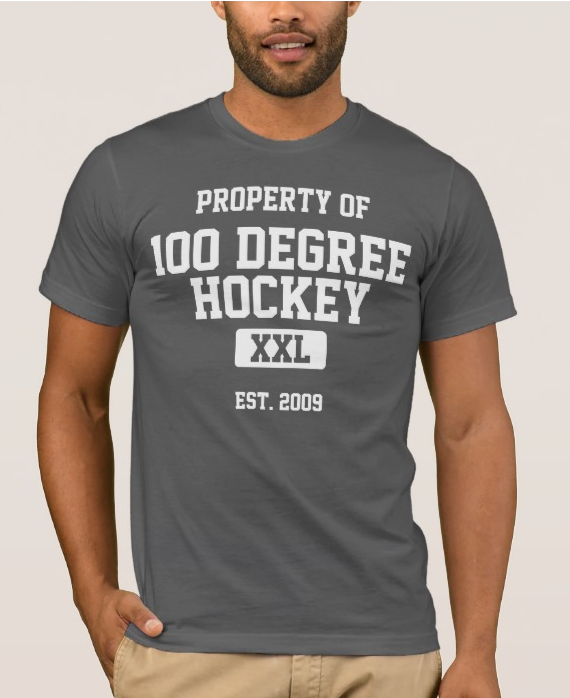 The 100 Degree Hockey playoff projections are getting a big overhaul for their seventh season. With this year's changes to the postseason qualification rules, the projections as they've existed aren't necessary anymore. New methodologies are needed to make them useful this year. The projections, which were one of the most visited pages on the site each season, helped to compensate for the fact that not every team had played the same number of games and points alone were being used to calculate standings. The projections helped to uncover pretenders in the standings, such as when the 8th place team is only in 8th place because they've played 5 more games than everyone else. At its core, the math behind the whole thing used the points percentage of each team and compared it to their number of games they had played to predict where they would finish. Most importantly, the sheet then used those numbers for every team to say how many points the 10th place team needed to catch up with the pace the 8th place team was on. Now everything is done via points percentage at all points of the season. My initial thought was to use something along the lines of baseball's 'games back' formulas to calculate things. Games back is a great formula and the reason why it works so well hinges on every game only having two outcomes: win or loss. When you add in OTLs and SOLs, the formula breaks. There were various possible solutions thrown around, which included normalizing wins based on games played. The most useful solution I could come to centers on the most important thing in all of professional sports: winning. The new projections do one simple thing: they show you how many games a team must win in order to climb to whatever playoff spot you are concerned about. By a nice happy accident, it also shows (with a negative number), how many games a team must lose to fall to a certain position. Self-same positions have been deleted. Dashed out boxes indicate that there is no way to achieve that position anymore (in either an upward or downward direction). Check out the playoff projections here or in the header for the rest of the season. The I-35 rivalry continued with Texas taking a 4-3 decision this evening in Cedar Park. Frequent contributor Travis Morin had a goal and two assists in the contest, which saw Texas jump out to a 3-0 lead after twenty minutes. "We bounced back from last night," said Coach Laxdal, referring to Friday's 5-2 loss in San Antonio. "Our team has been good at that all year. It was a well-rounded 60 minute effort." 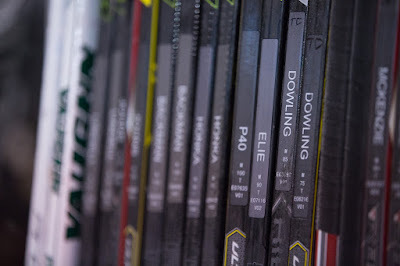 The Stars were rewarded for going to the dirty, tough areas of the ice against a Rampage club that likes to get physical and use size to its advantage. Coach Laxdal called it a "gutsy effort" from his skaters. 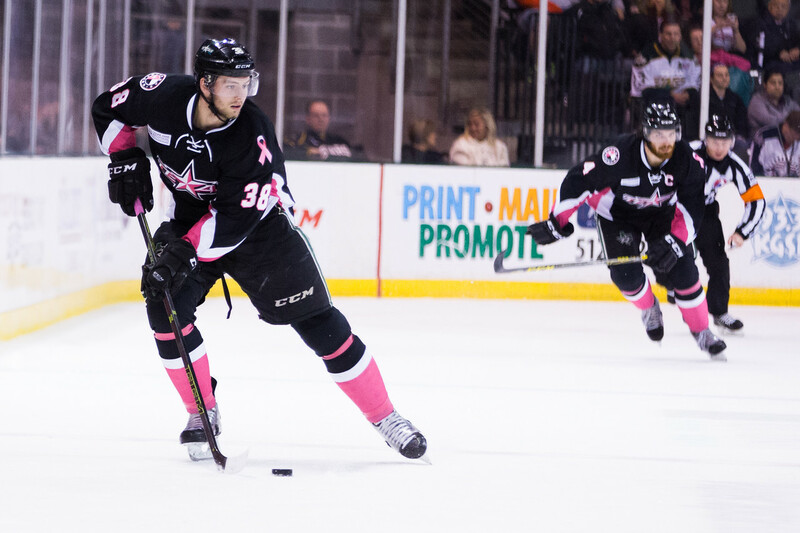 "It's heated up every time against San Antonio," added Matej Stransky. "They are a hard working team, on the body every time. We don't want to give them anything, so we have to stay on their bodies." Esa Lindell opened the scoring with a shot from the point off a long cycle by Texas. Brett Ritchie collected a goal off the backdoor, taking advantage of Travis Morin's vision to see him open there through traffic. The Stars power play cooked up the third goal of the night with Brendan Ranford tipped Stephen Johns' point shot for the 3-0 lead. "Coach Laxdal stresses bodies to the net and pucks to the net," said Johns. "We keep throwing bodies to the net, and [the defensemen's] job is to get it through and let the forwards do the work down there." San Antonio played a chess game on lines all night, cycling through three lines often. Laxdal matched Morin's line with Rantanen to "make him play defense" and neutralize the rookie, who had four points last night. With Rantanen neutralized, Borna Rendulic stepped up with a pair of goals in the second to make Texas nervous. The Stars captain answered back with another play off traffic in front. Julius Honka's point shot rebounded to Morin for the 4-2 tally. Laxdal noted, "That fourth goal was huge for us, gave us some breathing room and helped us manage our game." Texas kept San Antonio at bay through much of the third period, partly thanks to a strong forecheck led by Matej Stransky. "We wanted to send that first guy hard every time," said Stransky. "I felt pretty good today. I forechecked hard today and got some lucky bounces." With Roman Will on the bench, San Antonio would collect one more goal to bring it to 4-3. Maxim Noreau's ninth of the year would be the final tally of the night though. Philippe Desrosiers, pressed into service in back-to-back nights due to injury to Maxime Lagace, stopped 29 of 32 shots. Texas jumps on a plane tomorrow bound for Winnipeg. They will play the Manitoba Moose on Tuesday for the first time in five years. San Antonio made it back to .500 last night with their win over Texas. They'll seek to inch above that mark tonight in Cedar Park, traditionally a very tough venue for the Rampage. For Texas, much of the drama of the evening will be in who is available to play. Maxime Lagace and Greg Rallo, two key pieces of the Stars' surge in the standings last month, could both return from injury. The Stars couldn't overcome a third-period outburst by the Rampage in a game that saw five of the seven goals scored on special teams. Texas and San Antonio were tied heading into the third period. A power play goal from Garrett Thompson ended up being the game winner, but Mikko Rantanen and Reid Petryk tacked two more onto the scoring for the home side. Matej Stranky opened the scoring for Texas in the first period with a power play goal. 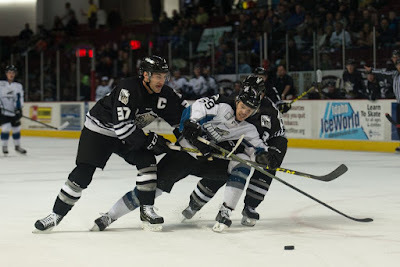 San Antonio answered back twice to put the Rampage up 2-1 after two. Travis Morin's 400th career point tied things at two in the second. The 2-on-1 shorthanded tally was his 13th goal of the year but the last Texas goal of the night. Philippe Desrosiers took the loss with 30 saves on 35 shots. 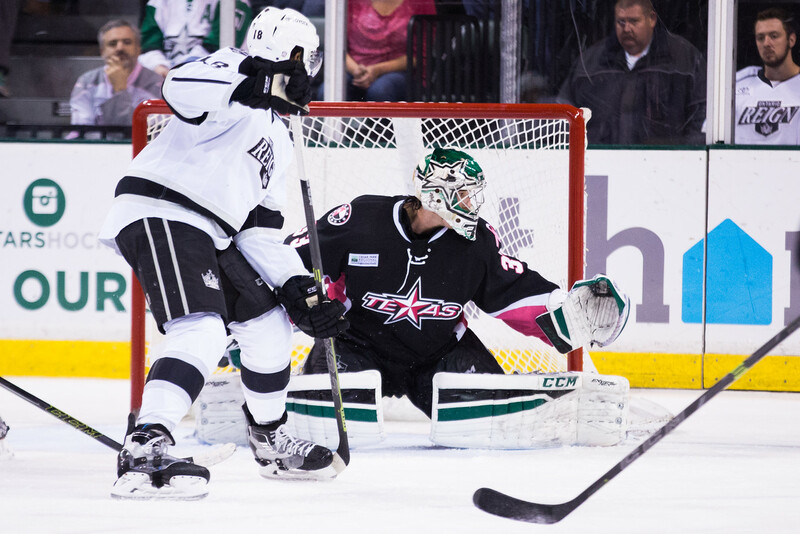 Maxime Lagace had been slated to start but was held out with a nagging lower body injury. John Muse backed up. These two teams face off again tomorrow in Cedar Park. 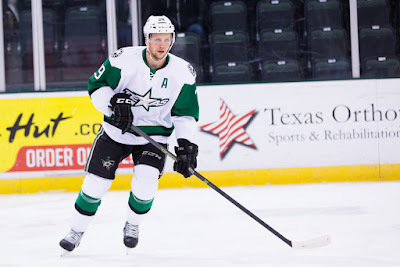 UPDATE: Radek Faksa has been recalled to the Dallas Stars. The San Antonio Rampage reached the All-Star Break with a resounding thud. After building up an 11-3-6 record at the end of November, they've compiled an 8-17-1 record since. They've had separate seven- and four-game losing streaks during that time and still face the uphill battle that is the Rodeo Road Trip. So it's been a tough few months in San Antonio. Injuries are a huge reason why, both in Texas and in Colorado. Calvin Pickard, who was part of that big win total at the start of the year, hasn't played a decision in San Antonio since before Christmas. Of course, he was the goalie of record for all seven of the losses in that aforementioned streak, so perhaps that's something of a non-factor. Pickard has been in Colorado thanks to injuries to the Avalanche. Rampage up to 98 man games lost due to injury upon return from ASG. Number jumps to 128 if you were to include Ben Street. His next tweet noted that Andrew Agozzino was the only non-participant in practice yesterday afternoon. With players coming back, San Antonio could be ready to go on a run with fresh legs. The team will face their hardest test of the year with the always nasty rodeo road trip putting them out for the rest of the month. Tonight's game is the only Rampage home game in the month of February. On the Texas side of the ledger, things aren't too rosy either on the injury front. Of course, Devin Shore has been out for a while and is done for the season after his surgery. Justin Dowling has been out for several weeks now along with Jesse Blacker. Maxime Lagace is probable for tonight, but could still be held out for precautionary reasons. And finally, the Stars' leading goal scorer, Greg Rallo, was injured in a slew-footing incident in Lake Erie a week ago. Jaime Sifers was suspended two games for the incident, which wasn't called on the ice. The good news is that Rallo could be back for tomorrow's game in Cedar Park. Branden Troock has been recalled from the Idaho Steelheads. With Greg Rallo still out Friday, Texas needed another body. Troock has five points in eight games in Idaho. 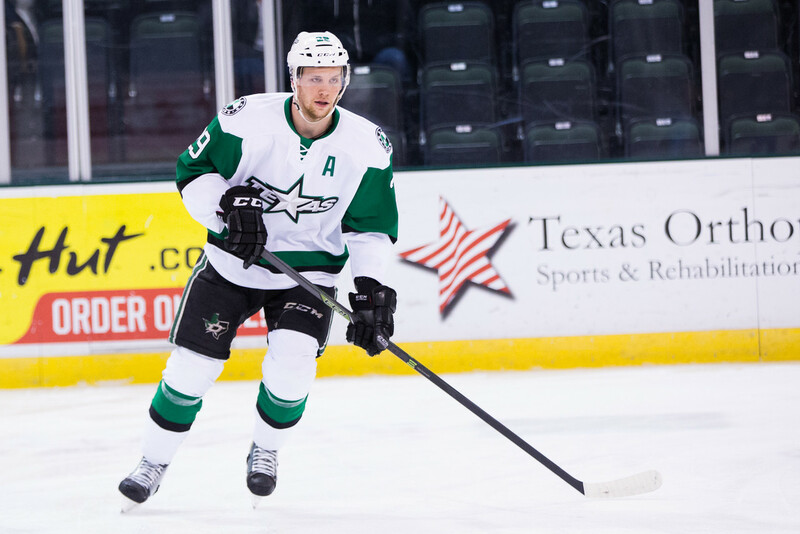 The Texas Stars, American Hockey League affiliate of the NHL’s Dallas Stars, announced Thursday they have recalled forward Branden Troock from their ECHL affiliate, the Idaho Steelheads. Troock, 21, has appeared in 20 games this season for Texas with three goals and seven assists. The 6-foot-2, 215-pound forward competed in eight ECHL games for the Steelheads during his recent assignment, and recorded five points (2-3=5). The Edmonton, Alberta native was selected in the fifth round by Dallas (134th overall) in 2012. Troock has 25 points (9-16=25) in 70 games in his AHL career. Radek Faksa has been on fire since returning from a brief stint in Dallas. The past week was no exception. In fact, the young Czech had the best month of his career in a Texas Stars uniform and he only played in half the games in January. After spending the start of the month in the NHL, Faksa hit the ground running with a two point effort in his first game back on the 15th. From there, he compiled six goals and seven assists, including three game-winners. His plus/minus sits at plus-12. Last week specifically, he had two goals and two assists in two games. 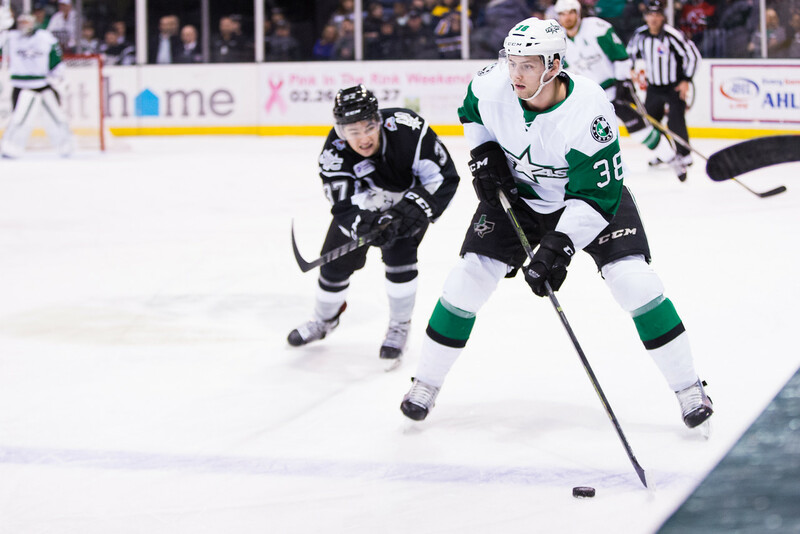 Faksa's current situation shows the growth and maturity of the Dallas farm system. The fact that the Stars can afford to put a player like Faksa in the minors shows that there is far more depth than several years ago. Could you imagine a first-round pick of Faksa's current calibre sitting in the minors back in 2012-13? Granted this piece is about Faksa, but Curtis McKenzie and Brett Ritchie's time in the AHL this season tells the same story. That would have been your fourth line in the Glen Gulutzan years. Last night's All-Star Challenge was the most engaging All-Star experience the AHL has had in years. There were high-scoring games and low; great goals and great goaltending. It was everything the league wants to showcase and all it took was a little format change. There's no question both the NHL and the AHL will be retaining their divisional format for the game in the future. Brendan Ranford and Esa Lindell were Texas' representatives in the event. Ranford had a pair of assists in the Pacific's 6-4 win over the Central. Esa Lindell had no points. The Central turned out to be the winner, and it's probably no surprise. The competition has been fierce there this season with six teams battling for what will probably be five spots (four plus the crossover) in the playoffs. The two All-Stars will return to a Texas Stars' squad that is ready for the stretch run to those aforementioned playoffs. Thanks to the strength of the Central, the Pacific division is at great risk of seeing its fourth place finisher knocked out of the playoffs in favor of the fifth place finisher in the Central. If the playoffs started today, Stockton would be staying home. Lake Erie would crossover to play Ontario while Texas would play San Jose. And how about those Texas Stars? Most reports are calling the post-All-Star time the 'second half' of the season. For Texas, the second half of the season started January 9th. The Stars have played the most hockey of any team in the league to this point in the season. The good news for Texas is that they are in second place in the division with the bulk of the season behind them. If they were down in the standings, the games played would be a liability. They'd have fewer games to catch up. Now, having cemented a bit of standings inertia, the Stars will play just 28 games in the next three and a half months. That affords time to practice up and heal up for the playoffs. Texas seems to be in pole position for the playoffs at the All-Star Break.